After more than a decade of progress in improving high school graduation rates, there remain about 1,300 traditional high schools in need of serious improvement and redesign, according to new research from the GradNation campaign. Among them are more than 800 low-graduation-rate high schools with an average graduation rate of 49 percent. From the inner city to the heartland, these high schools sit at the fault lines of race, class, and inequity in America. 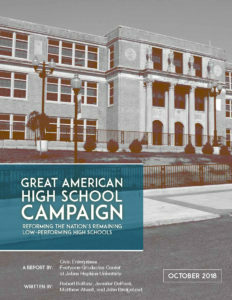 The Great American High School report, authored by Civic Enterprises and the Everyone Graduates Center at the Johns Hopkins University, was released today in partnership with America’s Promise Alliance and the Alliance for Excellent Education, the four leading organizations of the GradNation campaign working to increase the national on-time graduation rate to 90 percent. The research, which analyzes five national data sources from graduation rate data to Census data, identifies the progress made and remaining challenges in enabling all students to graduate from high school ready for college or career; documents the scale, scope, and location of the remaining low-performing high schools; shares the challenges these schools face; details what we know about effective and evidence-based high school reform; and lays out a path forward for supporting high school redesign in the communities and school districts that have not continuously improved. Follow this link for the executive summary.